These are available in solid shades, stripes, mottled, stenciled and also tile patterns. 2-chain creel mats and 3- chain creel mats are available in this category. 3-chain creel mats have a firmer structure than 2-chain creel mats. Special type of mats with jute twine sold under the name ‘carnatic mats’. designs and bevelled patterns for use in interior or exterior door fronts. Coir Mats are made on handlooms, power looms or frames and with or without brush. Creel Mats are known for its thin brush. Rod Mats for thick brush and Fibre Mats for compact brush. Latex/rubber backing makes the mats non-slip. 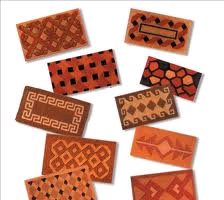 Available with woven or stenciled designs and bevelled patterns for use in interior or exterior door fronts.